In the previous sections, you began constructing and using more complex queries from inside a controller. In order to isolate, reuse and test these queries, it's a good practice to create a custom repository class for your entity. Methods containing your query logic can then be stored in this class. If you opt to create the repository classes yourself, they must extend Doctrine\ORM\EntityRepository. Next, add a new method - findAllOrderedByName() - to the newly-generated ProductRepository class. This method will query for all the Product entities, ordered alphabetically by name. Suppose that each product in your application belongs to exactly one category. In this case, you'll need a Category class, and a way to relate a Product object to a Category object. Start by creating the Category entity. Since you know that you'll eventually need to persist category objects through Doctrine, you can let Doctrine create the class for you. In this example, each category can be associated with many products, while each product can be associated with only one category. This relationship can be summarized as: many products to one category (or equivalently, one category to many products). From the perspective of the Product entity, this is a many-to-one relationship. From the perspective of the Category entity, this is a one-to-many relationship. This is important, because the relative nature of the relationship determines which mapping metadata to use. It also determines which class must hold a reference to the other class. This many-to-one mapping is critical. It tells Doctrine to use the category_id column on the product table to relate each record in that table with a record in the category table. Next, since a single Category object will relate to many Product objects, a products property can be added to the Category class to hold those associated objects. While the many-to-one mapping shown earlier was mandatory, this one-to-many mapping is optional. It is included here to help demonstrate Doctrine's range of relationship management capabailties. Plus, in the context of this application, it will likely be convenient for each Category object to automatically own a collection of its related Product objects. The code in the constructor is important. Rather than being instantiated as a traditional array, the $products property must be of a type that implements Doctrine's Collection interface. In this case, an ArrayCollection object is used. This object looks and acts almost exactly like an array, but has some added flexibility. If this makes you uncomfortable, don't worry. Just imagine that it's an array and you'll be in good shape. The targetEntity value in the metadata used above can reference any entity with a valid namespace, not just entities defined in the same namespace. To relate to an entity defined in a different class or bundle, enter a full namespace as the targetEntity. Ignore the Doctrine metadata for a moment. You now have two classes - Product and Category, with a natural many-to-one relationship. The Product class holds a single Category object, and the Category class holds a collection of Product objects. 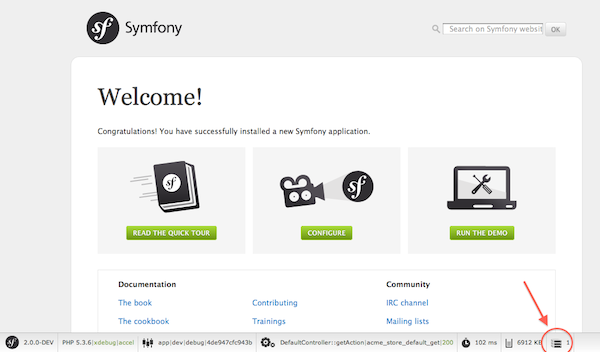 In other words, you've built your classes in a way that makes sense for your application. The fact that the data needs to be persisted to a database is always secondary. Now, review the metadata above the Product entity's $category property. It tells Doctrine that the related class is Category, and that the id of the related category record should be stored in a category_id field on the product table. 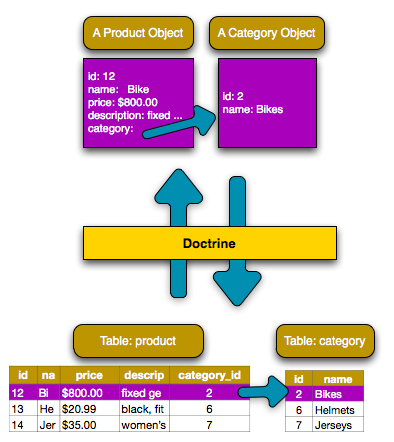 In other words, the related Category object will be stored in the $category property, but behind the scenes, Doctrine will persist this relationship by storing the category's id in the category_id column of the product table. The metadata above the Category entity's $products property is less complicated. 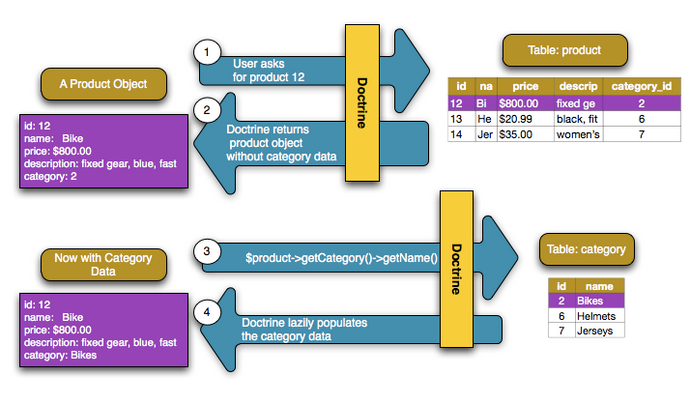 It simply tells Doctrine to look at the Product.category property to figure out how the relationship is mapped. In this case, the same things occur: you first query out for a single Category object, and then Doctrine makes a second query to retrieve the related Product objects, but only once/if you ask for them (i.e. when you call ->getProducts()). The $products variable is an array of all Product objects that relate to the given Category object via their category_id value.